A report from Philstar by Janus Bondoc revealed that there were seven messy projects left by the previous administration that has worsen today’s crime, traffic, and disease. “Seven messy projects of the past admin worsen today’s crime, traffic, and disease. Worth multibillions, the deals cripple police work, city commuting, and public health. Quality of life deteriorates.” Bondoc said. Bondoc cited the seven hot news below, that he said greatly affect the current government and the people. First in the list is the controversial purchase of the police patrol vehicles that were reportedly defective. • P1.9-billion purchase of flimsy police vans. The Senate is to look into a 2015 bid rigging for over 2,000 units from an inapt Indian supplier. Rules were for bidders with at least ten years’ domestic presence. But the National Police bought the Mahindra brand – no dealer network, after-sales service, and spare parts. The vehicles have since broken down, rotting in disrepair in police stations. Police mobility and response to distress calls are disabled. Sen. Grace Poe’s warnings in late 2014 against the Mahindra purchase were unheeded. There’s the undelivered police combat and patrol gear, as flagged by the Commission on Audit (CoA). And of course, the much-awaited car license plates. Up to date, the Department of Transportation was able to release backlog plates since 2016. • P3.8-billion bungled fabrication of land vehicle license plates. For three years now millions of new cars, trucks, and motorcycles have been plate-less. Many old plates also have been lost, torn, or cloned. Lawmen have no way to identify crime getaways; traffic aides cannot enforce number coding. All because, in 2013, the Dept. of Transport contracted a blacklisted Filipino and undercapitalized Dutch partners for the five-year project. Aside from bid rigging, there was no congressional funding, so the Commission on Audit forbade payment. Prototypes were not tamper-proof as required; the metal crumpled like paper in floodwaters. Import duties unpaid, 600,000 pieces lie abandoned in cargo containers at the Manila pier. The present Land Transportation Office had to rebid and acquire platemaking machines. It started distributing 250,000 new plates this week, but only for vehicles bought July 2016 onwards. Government has yet to recover advances and damages, and indict the culprits. Another wasted budget of problematic MRT-3 trains from China. Low quality parts resulted to another burden. At least 15 safety and reliability tests, involving 94 components, were left undone. Confirming the contract breaches, present Transport Sec. Arthur Tugade says he will make Dalian redo the railcars. Their inoperability sets back MRT-3’s expansion. Traffic has intensified along EDSA and, by consequence, the whole Mega Manila. And another MRT-3 gone-wrong deal. Then the untested anti-Dengue Dengvaxia vaccine that allegedly endangered the lives of 835, 000 children. • P3.5-billion untested anti-dengue vaccine. About 835,000 nine-to-12-year-olds were injected with untried Dengvaxia once to thrice from Apr. 2016 to Aug. 2017. Vaccinees were not blood-tested or queried for previous dengue infection. Parents’ consents were not sought; side effects unexplained. Malacañang rushed the project for the May 2016 election, in vote-rich Central Luzon, Metro Manila, Southern Tagalog, and Central Visayas. Last the definitely not the least, is the biggest worst decision that past administration's officials has ever made. • P8.1-billion infeasible construction of 5,700 barangay health stations in public schools. Malacañang allegedly rushed the release of the amount in Dec. 2015, along with the Dengvaxia deal. The money went to waste. Sites were unworkable and constructors ineligible. Delays were interminable; equipment were undelivered. Primary health care for the poor and hiring of barangay nurses never happened. 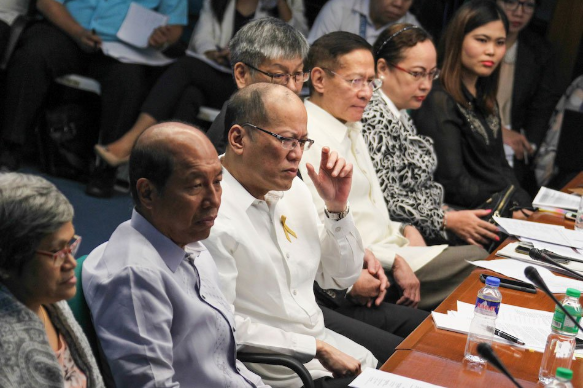 Ex-President Noynoy Aquino, budget secretary Florencio Abad, and health secretary Janet Garin deny any wrongdoing.